Less than 9" long and weighing only 7.5 oz., the HL 120 will impressively provide 120 lumens of power on a full charge; and will do so for 6 hours. 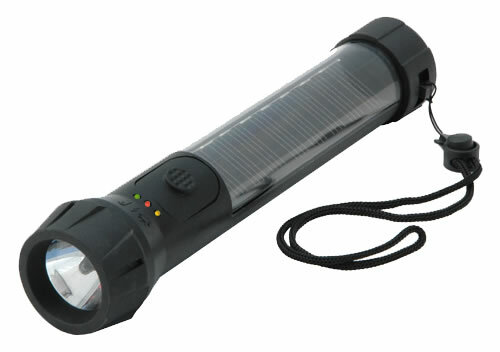 It is comfortably and functionally bright, waterproof (floats) plus incredibly durable. When the solar collector has discharged or dimmed, simply recharge using any light source (sun is best) but ambient or artificial light works too. Store or use; and then comfortably repeat the process again as needed. The HL 120 can be stored for 7 years and still retain 90% of the original power from three back up lithium batteries (#2032) which if needed, will provide 30 hours of backup power. Guaranteed to work every time you pick it up and click! In short , the HL 120 will find itself at the top of the most desired flashlights for all around use.
? Fully Charged right out of the box. No need to ever purchase batteries.
? Over 100,000 hours of use.
? Powered by the sun, ambient & artificial light, indoor and out.
? 100% waterproof & it floats.
? Holds a single charge for 3 full years without exposing it to light.
? Mono Silicon Solar Powered with battery backup ? Will charge using ANY light source: Alternative energy saves money.
? Always ready to use, eco friendly, and can be stored anywhere.
? Super Bright LED - Provides bright light with spot and wide path.
? Made of 50% polycarbonate and 50% plastic - Unmatched in durability.
? One piece construction - No chance to split at seams, Withstands strong impact.